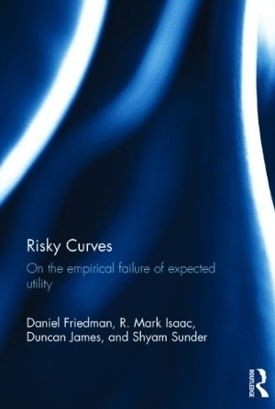 Risky Curves: On the Empirical Failure of Expected Utility by Daniel Friedman (UCSC), R. Mark Isaac (Florida St), Duncan James (Fordham) and Shyam Sunder (Yale) was published last month in hardcover by Routledge. It can also be found on Amazon. The book is intended to be read by advanced undergraduates, graduate students, professionals in Economics.public policy and other social sciences. Seven decades ago, Von Neumann and Morgenstern proposed curved utility functions for explaining choice under risk, generalizing a suggestion two centuries earlier by Daniel Bernoulli. That proposal continues to dominate the field, as theorists continue to devise new parameterized curves (e.g., for value from gains and losses, and for cumulative probability) while experimenters devise new protocols to elicit data and report estimates of parameters. From intensive interest and large volume of this literature, it is easy to get the impression of scientific progress. In this book, they show that the empirical harvest so far has, in fact, been quite meager. Estimated parameters (e.g., risk-aversion coefficients) exhibit remarkably little stability outside the context in which they are fitted. Their power to predict out-of-sample is in the poor-to-nonexistent range, and we have seen no convincing victories over naïve alternatives. Outside the laboratory, expected utility theory and its generalizations have provided surprisingly little insight into economic phenomena such as securities, real estate or labor markets, insurance, gambling, or business cycles. It is perhaps time to ask whether the failure to find stable replicable results is the result. Although their main purpose is to raise doubt about the current approach, they do offer some positive suggestions. They reconsider the meaning and measures of risk and of risk aversion; they recommend using simple expected value criterion, while looking for explanatory power in the constraints and the real options that decision makers face; and they note recent work in evolution, learning, and physiology that someday might lead to a better understanding of, and ability to predict, decisions in an uncertain world.